Myrtle Audrey Arinsberg, better known as Gogi Grant, may be a somewhat forgotten artist today but during 1957 she had one of the biggest hits of the year and of the rock AND ROLL ERA. Her “The Wayward Wind” ranked number 23 on the all-time list of BILLBOARD MAGAZINE singles, 1955-1996. It was a wonderful and smooth vocal performance that just flowed along. The initial crescendo was the perfect introduction to the song. Released during the early spring of 1956, it topped all four BILLBOARD Singles Charts. Best Sellers In Stores Chart – 6/12/56 – 6 weeks at number one. Most Played By Disc Jockeys Chart – 6/23/56 – 8 weeks at number one. Most Played In Jukeboxes Chart – 6/30/56 – 4 weeks at number one. Bbillboard Top 100 – 6/23/56 – 6 weeks at number one. She retired in 1967 but returned to performing late in life and has remained active well into her 80s. Proving that a good song is always a good song, “The Wayward Wind” re-charted during the spring of 1961 reaching number 50. Sometimes a good idea is really a good idea and so it was when Katy Boyd and Marty Atkinson decided to join together and form Blue Cactus Choir. The result of that union is Once In A Bluegrass Moon. Marty Atkinson is a bluegrass musician who spent over a decade as a member of the Cactus Choir. I reviewed Katy Boyd’s last studio album, Paper Hearts, which was a modern folk album with some country leanings. Together they meet somewhere in the middle. Their united sound fuses the instruments of bluegrass, the lyrics of folk, and the smooth production of modern country. They were in a prolific mood when they assembled the album as they wrote all 21 of the tracks. They also were wise enough to assemble many of the leading Nashville musicians to support them. They included banjo/mandolin/fiddle player Justin Moses and bassist Mark Fein, both of whom play in Ricky Skaggs band, plus steel guitarist Fats Kaplin, pianist Gary Smith, drummers Lynn Williams & Steve Brewster, and guitarist/keyboardist Thomm Jutz to form a tight backing band. The album is a fairly mellow affair as the tracks meander along in a cohesive manner. The listening experience is enhanced by the production and engineering, which is just about perfect. Each instrument is distinct and the vocals are crystal clear. The songs feature one or the other with the lead vocal and both then join together on the harmonies. Marty Atkinson has a wonderfully clear traditional country voice while Boyd’s is grittier. While they may seem different, when they combine the harmonies are tight and wonderful. “Blue Moon Over Mexico” and “Avalon” are the first tracks and establishes the style and tempo for what will follow. Atkinson’s clear voice presents the story, which leads to their harmonies. The constant use of a fiddle gives many of the tracks a poignant sound. Several of Boyd’s tracks, such as “A Cat Called Ginger and a Dog Called Fred Astaire” and “Don’t Send Me Flowers,” are catchy with witty and incisive lyrics. Their most adventurous track is “Where Do I Belong” which has a slightly harder edge as it approaches a country rock sound. The Blue Cactus Choir has released an excellent debut album, which presents their distinctive sound. It is music that wears well through multiple listens and leaves you wanting more. Article first published as Music Review: Blue Cactus Choir – Once In A Bluegrass Moon on Blogcritics. The Rascals, originally Young Rascals, were inducted in to THE ROCK AND ROLL HALL OF FAME in 1997. Their series of singles, 1965-1970, was one of the best of the era. 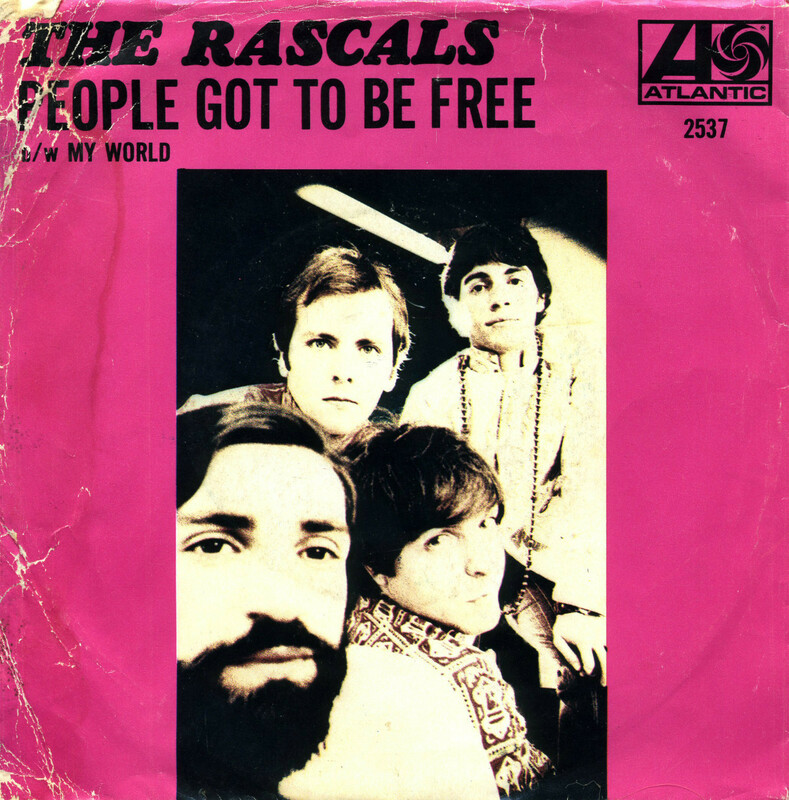 The biggest hit of their career came in 1968 when “People Got To Be Free” topped the BILLBOARD hOT 100 Chart for five weeks during the late summer. They always had a soulful quality to their music, which was labeled blue-eyed soul. They would disband during 1972 but there have been a number of reunions with various members down through the years. Eric Darling, 1933-2008, was a folk musician from his teens when he haunted the Greenwich Village clubs of New York City. By the age of 18 he had become adept on both the guitar and banjo. During his early 20s he formed the Tune Tellers and then the folk trio, The Tarriers, who placed two singles on the Billboard Magazine Hot 100. His life changed during 1958 when Pete Seeger left The Weavers and he was picked to replace him. He spent over four years as a member of the legendary folk group before going solo. This brings us to then 79 year old Gus Cannon. During 1930 he had written a blues song called “Walk Right In” and recorded it with his backing band, the Jugstompers. It came to the attention of Darling but he wanted to record it with a trio. He recruited guitarist Bill Svanoe and big band jazz Singer Lynne Taylor who had performed with Benny Goodman and Tommy Dorsey. And so the Rooftop Singers were born. His attraction to “Walk Right In” evolved into the highlight of his career. He and Svanoe both played 12-string guitars on the track and the trio’s harmonies were impeccable as they moved the old blues tune over to an up-tempo folk classic. The single sold over one-million copies and on January 26, 1963 reached the number one position on the Billboard Hot 100 where it remained for two weeks. It also topped the Easy Listening, now Adult Contemporary, Chart for five weeks. It even charted on the Country Chart, which was a good fit and on the R&B Chart, which was a real stretch. 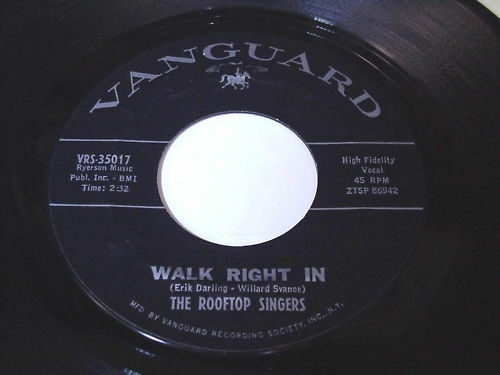 The Rooftop Singers remained together until 1967 with middling success. While they had two more singles reach the Hot 100, Darling always maintained that the group was assembled for one specific song and nothing else they released really measured up to “Walk Right In.” Darling and Svanoe continued to perform as a duo into the early 1970s but ultimately went their separate ways. The Rooftop Singers may not have changed the course of American music but 50 years ago this week they topped the United States music world. How the film CHARIOTS OF FIRE beat out RAIDERS OF THE LOST ARK for the 1981 Oscar for Best Picture I will never know. On the other hand, I can understand how the music won the Oscar for Best Original Score. 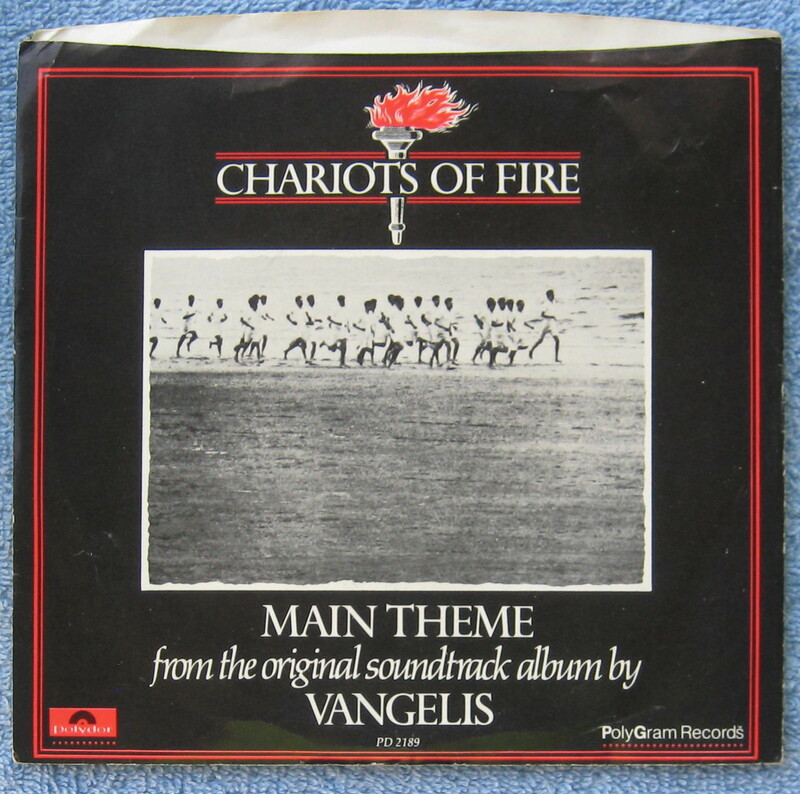 Vangelis wrote the score for the film and the title song was released as a single during late 1982. It spent 28 weeks on the BILLBOARD MAGAZINE Hot 100 and on May 8, 1982, reached the top of the chart where it remained for one week. It was an electonic keyboard driven track that was perfect for the film and radio. It would be Vangelis’ only chart single. From the time it first entered the charts, it took 21 weeks to reached number one, which was a record at the time. 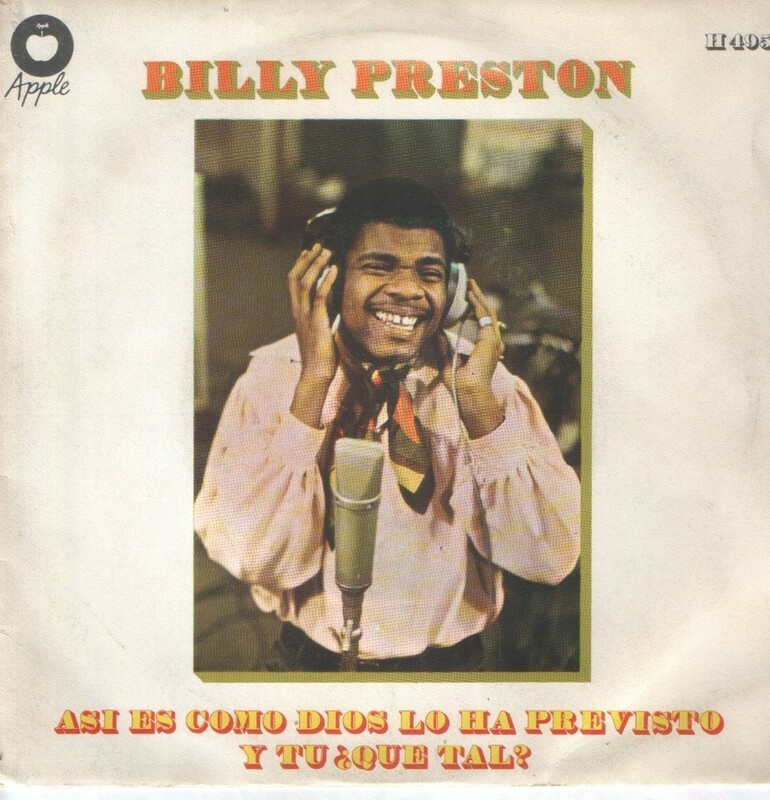 In many circles Billy Preston is best remembered for his work with the Beatles but he had a very successful career on his own. He placed 18 singles on the BILLBOARD MAGAZINE Pop Singles Hot 100 Chart, 1969-1982; two of which reached number one. The first chart song of his career was “That’s The Way God Planned It.” Released during the late summer of 1969, it peaked at number 62 during its six weeks on the charts. It was a gospel song with a passionate vocal. He used his keyboards to drive the melody along. He was also one of the first musicians to appear on SATURDAY NIGHT LIVE. 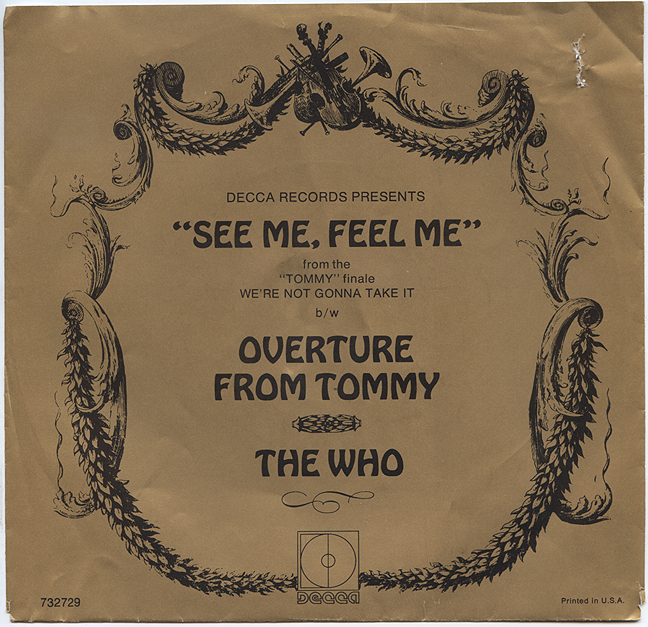 TOMMY by the Who has gone down in history as one of rock’s most creative and memorable albums. Released during 1969, its popularity has now spanned three generations. While the rock opera told a story, it did have three singles reach the BILLBOARD MAGAZINE Top 100 Singles Chart. The highest charting single from the album was “See Me Feel Me.” Released during the fall of 1970, it peaked at number 12. It was a song that built gradually and was fueled by one of Roger Daltry’s better vocal performances. It is a song that is still instantly recognizable today. You are currently browsing the Muskmellon's Blog blog archives for January, 2013.